The DC4K kit contains everything you need to launch a DC4K group at your church. Read more about the Activity Book or download a sample Activity Book chapter (Adobe Reader required). The Leader’s Guide is filled with step-by-step leader success tools, training and promotional materials, checklists, helpful hints, downloadable resource lists, and guidance on running your DC4K ministry. Download sample Leader’s Guide pages. The Lesson Plans book includes detailed leader instructions, an outline and agenda for each session, and weekly preparation lists for all 13 sessions. The Lesson Plans include detailed descriptions of games, activities, crafts, and devotions, plus direction on where to incorporate the songs, DVD dramas, Activity Book pages, and each piece of the kit. Download sample Lesson Plan. Attractive, professionally designed publicity brochures. Shipped flat in packages of 100 with a space to insert information about your DC4K group. Colorful posters sized “just right” for display on bulletin boards in your church or community and great for inserting in your church bulletin. Shipped 100 posters per package (two per 8.5 x 11" page), each poster includes a space for publicizing the specifics of your DC4K group. Included in the materials are two CDs with 30 songs written or arranged for the children in your group. One CD highlights the emotions and issues children of divorce face. The second CD presents children singing Scriptures and helps bring participants closer to God. Listen to sample music from Kids Like Me — divorce issue songs and Kids Singing Bible Songs — Scripture songs. Read a sample of the Stories for Kids in Divorce. 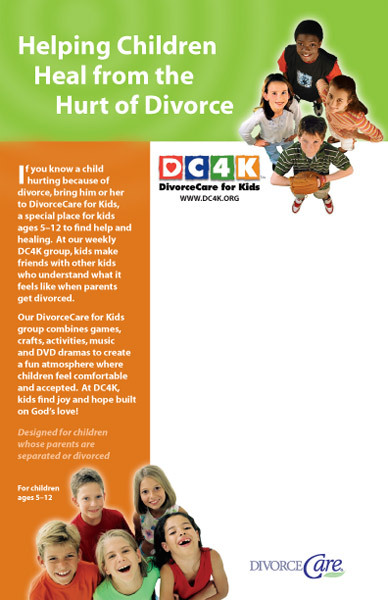 DivorceCare for Kids features 25 original video dramas on three DVDs, with two separate video dramatizations each week. Children connect with the character actors in the real-life drama in the Kids Like Me videos. During the Stories from the Bible videos, Uncle Bill helps his niece, nephew, and their friends understand what the Bible has to teach them about their lives. Watch episodes of Kids Like Me and Stories from the Bible. 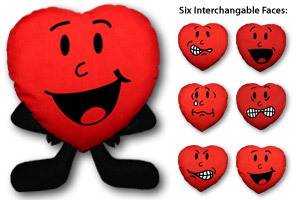 Herby, a handheld puppet, has six interchangeable pillow “feeling” faces. 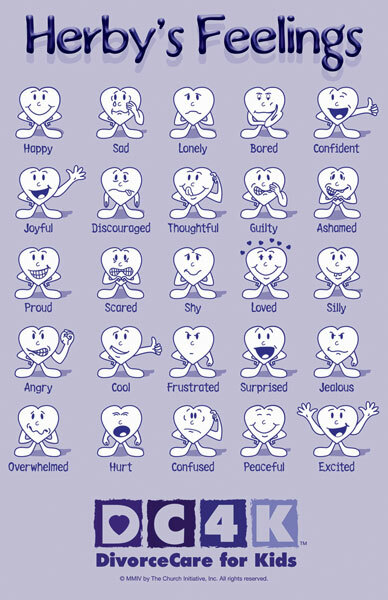 Herby is great to use to introduce various lesson concepts and emotions. Herby personalizes various Activity Book pages, and Herby’s musical rap welcomes the children each week. Included in the DC4K kit is a Leader Training Video, designed to give you an overview of what it takes to run a successful DC4K ministry. It’s an essential tool for training all DC4K volunteers at your church. Watch a sample of the video training. The durable green plastic carrying case can be used for easy storage and transporting DC4K materials or supplemental items such as art supplies. The Leaders’ Forum is a helpful tool we provide for our leaders. This email-based communications network is an active exchange of ideas between leaders around the world. The Forum is an excellent opportunity to share ideas, support, encouragement, praises, and prayer requests. Leaders receive a free, automatic membership. Upon ordering a curriculum kit, your church name and address is automatically added to our online “Find a Group” database, where people can search for the nearest groups by zip code, city & state, or country. 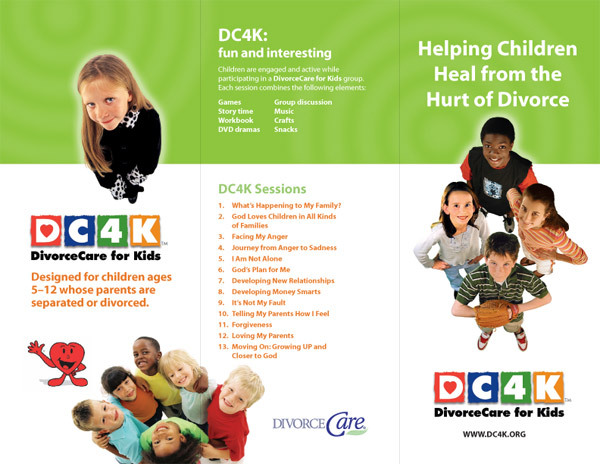 Free telephone support is available from the DC4K office by calling 1-800-489-7778.